PLATFORM SERVICES. Design, develop and run your Digital Experience Cloud. Unily’s Digital experience Cloud is a comprehensive platform built using a service orientated architecture. Each service is decoupled and uses best in class technology to provide exceptional experiences and performance. The very best security and performance ensures Unily's DXC is completely enterprise ready. The combination of platform services deliver a new generation of enterprise experience management platform. Being able to support and provide rich authentication experiences to stakeholders, whether they are from different operating businesses, partners or customers, is key for enterprises that use identity management solutions today. Supporting best of or breed identity management solutions, be it Azure Active Directory, Okta, PingFederate SSO, SiteMinder or any other OpenID Connect provider couldn’t be simpler with the Unily’s Digital Experience Cloud. The options are endless with the ability to configure support for multiple identity providers with a single instance of Unily’s DXC. Furthermore, directory data from these various identity providers can be synchronized into Unily’s DXC and augmented as required from other LOB applications such as Workday or SuccessFactors. With deep integration, you can invite external users into Unily’s Digital Experience Cloud directly from your solution using invite templates, safe in the knowledge that your business security remains unaffected. With Unily search, users can get to what they need fast. Enterprise-wide discoverability can build bridges between teams, functions and geographic locations putting content and knowledge in users’ hands from the moment they request it. Unily’s Digital Experience Cloud offers a highly versatile and powerful search tool that can index all the content you create in an instant. With built in configuration options, your platform owners can add new content types into search results as well as configuring the ranking and search results model. Performance and usage data are some of the most valuable tools for improving engagement with your enterprise portal. This data can provide unique insight into the digital experiences your users love and the areas that can be optimized for even greater performance. This is all made possible with a comprehensive set of platform analytics and data visualizations. Covering everything from page views to user journeys, you will be able to truly understand the impact your solution is having against KPIs. Our out-of-the-box dashboards tell the story at a glance, but you can dig into the data as it is made available in real-time, segmenting it across audiences, regions and date ranges to report on any specific aspects. Centralized micro-services enable you to use a comprehensive set of common services to retrieve content and perform common tasks. Machine translation for editors, stock images for content creators as well as weather and stock price feeds, deliver maximum value without management overhead. And with a cognitive services based dictionary for the translation of the most common labels, multilingual experiences have never been easier to manage. We know that security is a primary concern for our customers. We deliver the highest standards of data control and security. Unily’s Digital Experience Cloud can be deployed within chosen regions to meet any data sovereignty requirements and operates as a single tenancy application to ensure data segregation across shared infrastructure. Unily’s DXC also adopts internationally recognized standards for the management of Business Information Security with both ISO27001 and SOC 2 accreditation. Security runs a lot deeper than just technology and platforms. Being able to effectively manage who has access to what in your enterprise portal ensures secure content stays that way. Group users into easily managed security groups and then set their access rights across your entire portal for both viewing and editing different content. Out-of-the-box integration with Azure Active Directory means there is no need to reinvent the wheel when it comes to security. You can take advantage of your existing security model and groups within Azure AD to manage access and editing rights. Native Mobile Apps. Access content anywhere, anytime on any device. Unily’s Digital Experience Cloud offers native mobile apps for iOS and Android, delivering a complete multi-device experience. By using a decoupled publishing approach all the content on Unily's DXC can be viewed via native apps including custom pages, navigation structures and social experiences. Using our native apps is as simple as entering a cloud code. Where Unily’s DXC apps aren't quite enough for your specific audience, a bespoke white-labeled app is the answer. Distributed in public or private app stores it can be completely branded and work with the most popular Mobile Device Management platforms for extra layers of security. As your portal evolves to keep pace with change in your business, being able to extend its capabilities will ensure it continuously adds value and engages users. With Unily’s Digital Experience Cloud there is an extensive catalogue of plugins at your fingertips in our central store. With an ever-growing collection of new widgets and templates that are just a click away, you can download and install these packages directly within your portal and make your experience go further with pre-built feature plugins. Regardless of how deep and rich the user experience is, if pages take too long to load you will lose users. With a combination of cloud infrastructure, application design and the use of Content Delivery Networks, the Unily Cloud delivers blistering performance no matter where you are in the world. Unily’s DXC will scale irrespective of the size of your user base. Using our cloud infrastructure there is no need for you to worry about capacity planning and scalability. Whether you have hundreds or millions of users, Unily always performs. NOTIFICATIONS THAT KEEP USERS CONNECTED. With so many digital platforms vying for time and attention, notifications are the key to engaging and connecting users on your platform. 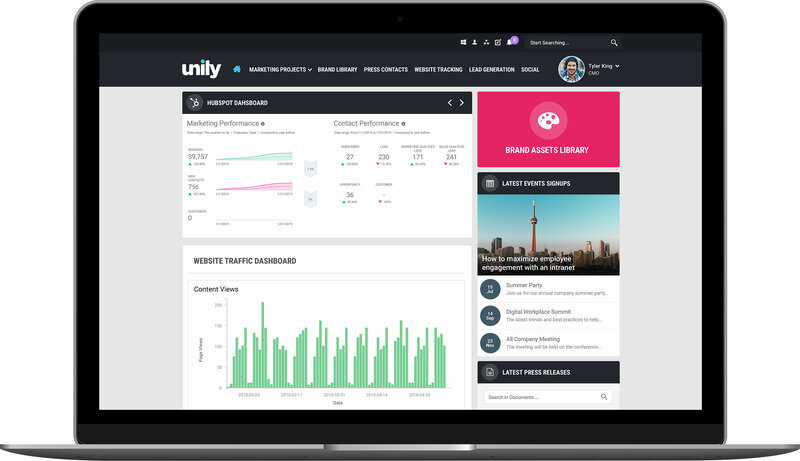 Unily's DXC offers a comprehensive set of notifications across web, mobile and email, covering everything from social activity, content publication and process flows. With a personalized notification tray, users can see what they have missed and what requires their attention at a glance. Automated notification settings can be set portal-wide, while a settings control available to each user puts them in control of their notification model. Through the addition of manual notifications that can be designed and targeted to the right audience, no essential message need go unnoticed again. With Unily DXC’s mobile push notifications you can reach every user and front-line worker across any device, breaking down barriers and ensuring they don’t miss a crucial notification again.